Win a 42 Bottle wine rack in the Wineware Spring Competition! Once again it’s Competition time! 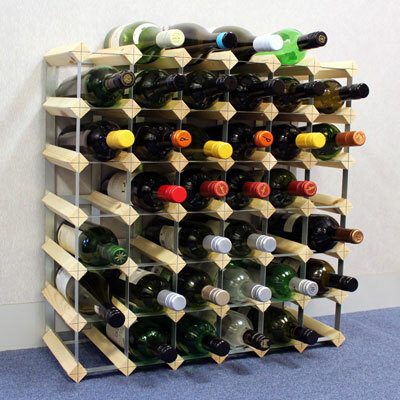 Do you want to WIN a 42 bottle fully assembled wine rack from Wineware? If so, simply enter our Spring Competiton…and you could be the lucky recipient, it really is that easy! This pre-made wine rack has natural pine slats and a galvanised steel frame, allowing you to store up to 42 bottles! This traditional style wine rack can fit anywhere in your house, whether it’s in the dining room, kitchen, garage or even under the stairs! Just remember, wine likes to be stored at constant temperature, so find somewhere in your home where the temperature doesn’t fluctuate too much. How do I enter the Wineware Spring Competition? It’s simple! To be in with the chance of winning our fantastic Spring prize…simply like us on Facebook, follow us on Twitter, Tweet us, or leave a comment on the blog! Win a 42 Bottle wine rack in Wineware’s Competition! The Wineware Spring Competition ends midnight on 31/03/2015…so enter now to be in with a chance! I would try to use it at least once a week. Weekends and special occasions only! I say weekends only – that’s because I’m trying to cut back and not drink through the week 🙂 So I guess anytime we had a bottle open really! I would put it in our new dining area. We’ve got a cupboard in the corner of the room that we are turning into a bar, this would be perfect to convert part of it! It would be regularly used in my dining room!!! I would have this in the kitchen, that being said though it really could be used in any room and would not look out of place. I’d keep it in the garage stocked and ready for when friends come over. I would put this in my kitchen if I won it. I’ve got a galaring big space between a corner cabinet and the fridge, this’d be the perfect home for this. This would have pride of place in my living room! It would go lovely in my dining room and would be a great talking point! I think it would go in my kitchen or possibly under the stairs, don’t think I have 42 bottles of wine, but this would be a great excuse to get some more! Nice Rack!! Would look nice with some wine in it!!! I’d put it in my dining room and it’d be full! I would display this in my dining room. I have so many wine bottles and I don’t have a place to store them. Excellent prize. Time to get blotto! in the cupboard under the stairs but only because there in no room for it elsewhere unfortunately! I have the perfect spot for it, under my stairs when the direct sun and temperature won’t spoil the wine. I would love to display this in my dining room. Lovely prize. Would love to be entered. It would go in my kitchen by the fridge. If I won, I would put wine rack in my kitchen. It would be pride of place in my kitchen!! In my kitchen, away from the sun. I’d fill it with bottles, – oh, that would be fun! I’d love this wine rack, – so please pick me! in my kitchen,next to the cupboard where all my wine glasses are,good luck all. After moving to the UK 2.5 years ago I have slowly but surely started rebuilding my wine collection. It is now gotten completely out of hand and I have wine everywhere, in the living room, kitchen, bedroom and hallway. I need help and this wine rack seems to be a perfect solution! In the dining room so I can have a bottle of red handy. Just what I need in my cellar ! Would look fantastic in dining room! I’d have to find a space in the kitchen! I would put this in our utility room that’s attached to our kitchen.